Inspector Alexander Collier Mysteries will often provide a choice for the reader. If you want to obtain a greater understanding and/or a ‘feel’ for the period follow the embedded links (high-lighted and underlined) sometimes found in the text of the story. Collier was preoccupied with a phone call from Detective Inspector Ellis Smyth from Scotland Yard when Sergeant Snowden popped his head around the partially opened door to his office. Waving him in, Collier directed him towards the two chairs in front of his desk as he swiveled about to open his notebook on the table behind him. “So the dead man hasn’t been identified yet?” Collier asked Smyth. “Not yet. 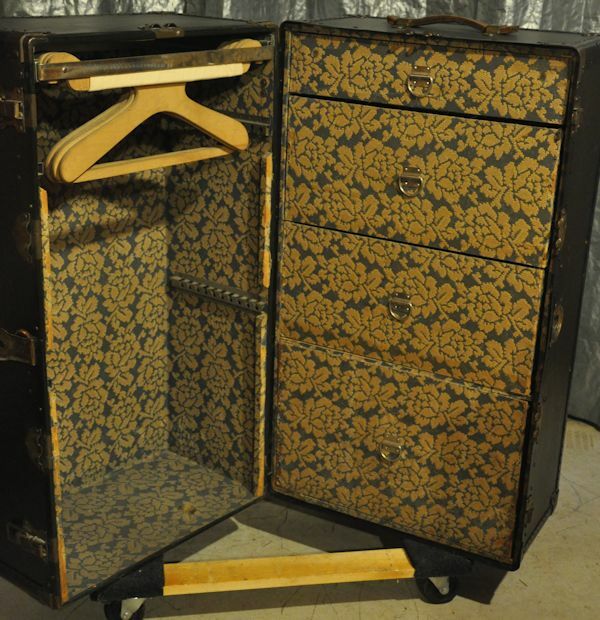 What we have is a wardrobe steamer trunk that had been sent from Bournemouth on November 16 containing his body, the dead man’s fingerprints and a number of prints lifted from the trunk.” Smyth replied. “Decomposition was quite extensive but the examiner figured three maybe four weeks. His neck was snapped. I’ll send along a copy of the autopsy report as well. You should have everything in your hands sometime late tomorrow morning. If something breaks, I’ll let you know. Turning back to hang up the phone, Collier noticed that Sergeant Snowden was still standing at the door. Beside him was a tall slender woman in her late twenties dressed in a tweed skirt with matching jacket and white blouse. “Um…ah…Sergeant?” Collier stammered as he slowly returned the telephone receiver to its cradle. Collier couldn’t hide the shock that registered on his face since he had never entertained the thought of Captain Hall being anything other than a male. Clearing his throat, he recovered his composure and came around his desk to greet her. Walking to him with a noticeable limp, she reached out and firmly shook his hand. Her eyes were cold and grey like gun barrels that had him firmly fixed in their cross-hairs. And, as he released his grip, it was the first time he felt slightly unnerved in someone’s presence. This entry was posted in Betrayal of Trust, Short Story, Writing and tagged B. B. Wright, Bournemouth, Hamlet, Inspector Alexander Collier, Shakespeare, steamer trunk. Bookmark the permalink.